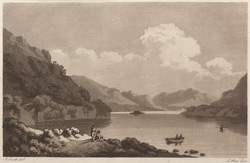 View of the lake of Ullswater in Cumbria, Northern England. The lake is the second largest of the waters in the Lake District and is approximately three miles in length, three quarters of a mile in width and two hundred and five feet in depth. The name Ullswater means ‘Ulf’s water’ and is thought to derive from an early Nordic Chief named Ulf, who settled in the area. The lake’s history dates from before Ulf however and a prehistoric stone circle known as The Cockpit can be seen on the fells above the lake.